Transglutaminases (TG) form a family of enzymes that catalyse various post-translational modifications of glutamine residues in proteins and peptides including intra- and intermolecular isopeptide bond formation, esterification and deamidation. We have characterized a novel member of the mammalian TG family, TG6, which is expressed in a human carcinoma cell line with neuronal characteristics and in mouse brain. Besides full-length protein, alternative splicing results in a short variant lacking the second β-barrel domain in man and a variant with truncated β-sandwich domain in mouse. Biochemical data show that TG6 is allosterically regulated by Ca2+ and guanine nucleotides. Molecular modelling indicates that TG6 could have Ca2+ and GDP-binding sites related to those of TG3 and TG2, respectively. Localization of mRNA and protein in the mouse identified abundant expression of TG6 in the central nervous system. Analysis of its temporal and spatial pattern of induction in mouse development indicates an association with neurogenesis. Neuronal expression of TG6 was confirmed by double-labelling of mouse forebrain cells with cell type-specific markers. Induction of differentiation in mouse Neuro 2a cells with NGF or dibutyryl cAMP is associated with an upregulation of TG6 expression. Familial ataxia has recently been linked to mutations in the TGM6 gene. Autoantibodies to TG6 were identified in immune-mediated ataxia in patients with gluten sensitivity. These findings suggest a critical role for TG6 in cortical and cerebellar neurons. H. Thomas and K. Beck contributed equally to this work. The online version of this article (doi: 10.1007/s00726-011-1091-z) contains supplementary material, which is available to authorized users. Transglutaminases (TG) are a family of structurally and functionally related enzymes that post-translationally modify proteins by catalysing a Ca2+-dependent transferase reaction between the γ-carboxamide group of a peptide-bound glutamine residue and various primary amines. Most commonly, intra- or intermolecular γ-glutamyl-ε-lysine crosslinks are formed by reaction with the ε-amino group of a lysine residue (Folk and Chung 1973). The action of these enzymes consequently results in the formation of covalently crosslinked, often insoluble supramolecular structures and has a well-established role in tissue homeostasis in many biological systems (Aeschlimann and Thomazy 2000; Lorand and Graham 2003; Iismaa et al. 2009). Besides crosslinking, peptide-bound glutamine residues may be modified by TG through reaction of the acyl-enzyme intermediate with low-molecular-weight metabolites harbouring amino groups, or through hydrolysis or esterification. Conversion through hydrolysis is comparably slow and occurs preferentially at pH < 6.5. Nevertheless, the biological significance of enzymatic deamidation of glutamine has been illustrated by its role in T-cell activation in celiac disease (Molberg et al. 1998; Van de Wal et al. 1998). Transamidation has profound effects on the biological activity of many substrate proteins and it has become clear that some TGs preferentially form intermolecular crosslinks, whereas others catalyse primarily intramolecular reactions (Candi et al. 1995). Such protein modifications can be dynamic as conversion of the acyl-enzyme intermediate to the isopeptide bond is reversible (Parameswaran et al. 1997). TGs are evolutionarily related to papain-like cysteine proteases, both in terms of the structure of the core domain and the mechanism of catalysis, and more distantly to the peptide N-glycanases. Other enzymes have evolved in lower species that can catalyse the same transamidation reaction. These, however, bear no genetic relationship to the TG genes in man and the mechanism of catalysis is distinct, although it depends on a reactive thiol in the enzyme active site. These include Streptomyces microbial TG, bacterial toxins (including cytotoxic necrotizing factor from E. coli and dermonecrotic toxin from Bordetella), and thioredoxin/protein-disulfide isomerase-like enzymes from primitive eukaryotes (e.g. ERp60-like from nematodes and PDI from Giardia). Nine different TG genes have been characterized in mammals (Aeschlimann and Paulsson 1994; Aeschlimann et al. 1998; Grenard et al. 2001). They exhibit a similar overall organization, with remarkable conservation of intron distribution and intron splice types. Detailed comparison of the structure of the individual genes shows that they may be divided into two subclasses, wherein the TGM2-7 and EBP42 genes contain 13 exons, and the F13A1 and TGM1 genes contain 15 exons (Grenard et al. 2001). Exon 9 of the former group is separated into two exons, 10 and 11, in the TGM1 and F13A1 genes, and the non-homologous N-terminal extensions of factor XIII a-subunit and TG1 that are absent in other TGs are comprised by an additional exon. Several TG gene products have been characterized in detail using a combination of mutagenesis and structural studies to elucidate the enzymatic mechanism and its regulation. The three-dimensional structures of three TGs have been solved, i.e. factor XIII a (Yee et al. 1994), TG2 (Liu et al. 2002) and TG3 (Ahvazi et al. 2002). All comprise of four domains that are similar in organization: an amino terminal β-sandwich domain which forms a functional unit with the core domain; the catalytic core domain that contains the conserved active site triad cysteine, histidine and aspartate residues; and two C-terminal β-barrel domains which are involved in the regulation of enzyme activity. Molecular modelling and docking studies on TG3 proposed that binding of two additional Ca2+ ions converts the enzyme to the active form on the approach of the first substrate (glutamine-containing polypeptide) (Ahvazi et al. 2004). A recent X-ray structure of a trapped transamidation intermediate of TG2 (Pinkas et al. 2007) explained for the first time how a crosslinked protein complex could be released from the enzyme after catalysis as well as the considerable increase in radius of gyration observed by small-angle X-ray scattering for activated TG2 in solution (Mariani et al. 2000). TG2 undergoes a large conformational change whereby the β-barrel domains are rotated almost 180° into the plane of the other two domains, thereby exposing the enzyme active site (Pinkas et al. 2007). TGs have been implicated in the pathogenesis of several neurodegenerative diseases (polyglutamine expansion diseases, Alzheimer’s, Parkinson’s and supranuclear palsy), but despite extensive investigation over at least two decades ambiguity remains as to the physiological function of TGs in the central nervous system (CNS) as well as their role in pathogenesis (for review see Iismaa et al. 2009; Jeitner et al. 2009). It has been shown that pathological length CAG expansions are excellent substrates for TG2 and that TG2 activity is increased in the brains of patients with Huntington’s disease (HD) and certain forms of spinocerebellar ataxia (SCA) (Lesort et al. 1999). In Alzheimer’s disease TGs have been localised to plaques and tangles and these contain substrates of TG2 (Kim et al. 1999). 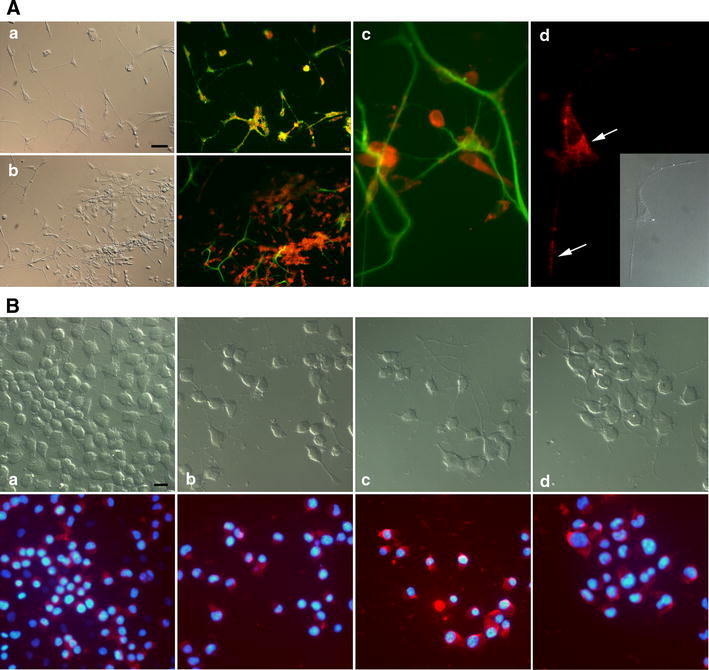 Similarly, the presence of TG crosslinked α-synuclein in substantia nigra dopaminergic neurons of Parkinson’s disease patients has been demonstrated (Andringa et al. 2004). The fact that increased levels of the γ-glutamyl-ε-lysine crosslink as well as bis-γ-glutamylpolyamine are found in the affected tissue and in the cerebrospinal fluid (Zainelli et al. 2003; Nemes et al. 2004; Jeitner et al. 2008) indicates that TG2 and possibly other TG isozymes extensively modify proteins and possibly also disease-specific protein aggregates. Mouse models have substantiated a direct role of TG2 in the pathogenesis of Huntington’s and other neurodegenerative diseases albeit the mechanisms involved being somewhat unexpected. HD mice (R6/1 and R6/2) lacking TG2 exhibit delayed mortality and behavioural deficits but have increased aggregate formation (Mastroberardino et al. 2002; Bailey and Johnson 2005). It is therefore possible that TG2 contributes to the pathogenesis by modulating the size of the aggregates formed, leading to the formation of smaller aggregates (Lai et al. 2004) that may be more neurotoxic. In an Alzheimer’s disease model, fibrillar Aβ triggers dimerization of angiotensin II type 2 receptors (AT2) which becomes a substrate for TG2 and is further oligomerized (AbdAlla et al. 2009). AT2 oligomerization results in sequestration of Gαq/11 G protein which impairs M1 muscarinic receptor function. Excitotoxic neuronal cell death is an important component of acute injury in the CNS and also chronic neurodegenerative diseases. Tissue-specific overexpression of TG2 in mice sensitizes hippocampal neurons to apoptosis upon glutamate receptor overstimulation (Tucholski et al. 2006) and ischemic injury induces rapid upregulation of TG2 expression (Ientile et al. 2004) consistent with its regulation by acute-phase injury cytokines. A recent study provides evidence that TG2 has a broad effect on gene transcription by regulating chromatin structure through N-terminal polyamination of histone H3 in a model of HD and that TG2 inhibition protects striatal neurons from NMDA-mediated toxicity (McConoughey et al. 2010). Inflammation is a component of neurodegenerative diseases including HD and mediators such as TNFα may play a critical role in upregulating TG2 expression locally. Cytokine-mediated TG2 induction in astrocytes has been shown for acute spinal cord injury (Monsonego et al. 1998) and MS lesions (van Strien et al. 2011). It has also become clear that there is significant complexity in the regulation of TG activity in the CNS. Two TG2 variants in addition to the full-length protein have been described in brain (Monsonego et al. 1998; Citron et al. 2002; Antonyak et al. 2006; Tee et al. 2010). These result from alternative splicing, giving rise to truncated proteins essentially lacking either β-barrel 2 or both β-barrel domains and having unique short C-terminal sequences. Expression of these variants causes distinct changes in regulation of cell differentiation and survival as a consequence of differences in GTP binding of the variant proteins (Antonyak et al. 2006; Tee et al. 2010). Although the major contribution to TG activity in the CNS, and cerebral cortex in particular, has been ascribed to TG2 (Bailey and Johnson 2004), γ-glutamyl-ε-lysine crosslinks are formed in TG2−/− brain (Mastroberardino et al. 2002). Abundant expression of at least two other TG isozymes, TG1 and TG3, in the CNS has been shown (Kim et al. 1999), but the functional importance of this remains to be investigated. Here we characterize the hitherto uncharacterized TGM6 gene product and discuss it in the wider context of CNS development. Detailed descriptions of experimental procedures are given in “Supplemental Material”. H69 cells (American Type Culture Collection) were maintained as floating cell aggregates at a density of 6–30 × 104 cells/ml in RPMI 1640 medium supplemented with 10% heat-inactivated foetal calf serum (FCS) containing 100 units/ml penicilin and 100 μg/ml streptomycin. HEK293-EBNA cells were grown in DMEM:Ham’s F-12 medium (1:1) supplemented with 10% FCS, 250 μg/ml G418 (Invitrogen) and antibiotics. Neuro 2a cells (European Collection of Cell Cultures) were maintained in high-glucose DMEM supplemented with 10% FCS and antibiotics. For differentiation, cells were seeded at 5,000 cells/cm2 in 24-well plates and stimulated for 3 days by reducing FCS to 0.5% and where indicated, adding 50 ng/ml NGF (Millipore), 1 mM dibutyryl cAMP (Sigma), or 10 μM retinoic acid (Sigma). Overlapping fragments (corresponding to nucleotides 71–502, 409–876, 705–1,442, 1,369–1,720 and 1,666–2,292 in AF540969) of TG6 were amplified by RT-PCR from H69 poly(A)+RNA. The 5′-end of the cDNA was isolated by 5′-RACE PCR as described (Grenard et al. 2001) and the transcription initiation site determined by primer extension. A full-length cDNA for TG6 was constructed by subcloning the overlapping fragments as described (Hadjivassiliou et al. 2008). The full-length cDNA encoding TG6-L or TG6-S was subcloned into the pCEP-4 vector for expression in HEK293 EBNA cells (Smyth et al. 2000). Cell strains stably expressing TG6 were generated by transfection with lipofectamine (10 μl for 2 μg plasmid DNA) and selection with puromycin, starting with 0.5 μg/ml puromycin after 48 h and gradually increasing to 10 μg/ml over a 10 day period. 5 μg of H69 cell poly(A)+RNA was separated in a 1.2% agarose gel, transferred to a nylon membrane and probed with a digoxigenin(DIG)-UTP-labelled single-stranded RNA probe corresponding to nucleotides 1,484–2,212 (AF540969) of TG6. For cloning of mouse TG6, we prepared cDNA from BALB/c brain and used a series of gene-specific oligonucleotides modelled from the human TG6 sequence to isolate overlapping DNA fragments by PCR. The 5′-end of the sequence was determined using 5′-RACE PCR and yielded besides the full-length mTG6 sequence a transcript with an alternative exon 1 (AY177607). Real-time PCR to quantify TG6 mRNA expression was carried out on an ABI 7700 Sequence Detection System using the 5′ nuclease assay with primers 5′-CAGCAGTGGTAGGAGTGACAG (300 nM) and 5′-CTCTTGGAAGGGGTTATGTTG (600 nM) and labelled (5′ 6-carboxyfluorescein and 3′ 6-carboxytetramethylrhodamine) probe 5′-CAAGGACAGCTAAGTATTGAGGTGCCCAG. Reaction conditions were as previously described except using 4 mM MgCl2 (Stephens et al. 2004). A three-dimensional model of human TG6 was generated using ProMod II (version 3.70 SP3; Arnold et al. 2006) with the X-ray derived coordinates of human TG3 in its activated form (Protein Data Bank code 1L9N, chain A; Ahvazi et al. 2002) and the GDP-bound form of TG2 (1KV3, chain C; Liu et al. 2002) as a template resulting in final total energies of −32,300 and −17,400 kJ/mol, respectively, after optimizing the alignment manually. TG activity was determined by measurement of the incorporation of biotin-x-cadaverine (Molecular Probes) into N,N-dimethylcasein immobilized on the surface of protein binding 96-well plates essentially as described (Kleman et al. 1995). The effect of nucleotides on TG activity [human TG6 (T021; Zedira) or TG2] was quantified by measuring changes in fluorescence intensity over time at 37°C as a result of cleavage of Abz-APE(γ-cad-Dnp)QEA (A102; Zedira) in the presence of different concentrations of GTP, GTPγS, GDP, GMP and ATP (Sigma). Fluorescence in the absence of enzyme activation (no Ca2+) was subtracted and reaction rates derived by linear regression. To obtain steady-state kinetics for the replacement reaction, acyl donor substrate concentration was varied from 3.2 to 170 μM. Product concentration was derived from a concentration series of Abz-APQQEA. The kinetic parameters v max and K M were obtained through nonlinear regression [v = (v max S)/(K M + S)] and k cat calculated using k cat = v max/E 0. All experiments were performed at least twice independently. Sagittal sections of adult BALB/c mouse brain or mouse embryos at different stages of gestation (E9–E16 and P0) were hybridized to DIG-labelled 325 bp sense and antisense RNA probes corresponding to the transcript region encoding the TG6 β-barrels. Binding of the probes was detected using alkaline phosphatase-conjugated anti-DIG antibodies and visualized with NBT/BCIP. Polyclonal antibodies to TG6 were raised in goat against a peptide comprising residues 482–492 of mouse TG6 conjugated to hemocyanin (Hadjivassiliou et al. 2008) and affinity purified over a thiol Sepharose column bearing disulphide-linked peptide CGWRDDLLEPVTKPS as described (Aeschlimann and Paulsson 1991). The sequence of this loop connecting the catalytic core and β-barrel 1 domain is shared among all TG6 splice variants but highly divergent between different TGs. The absence of cross-reactivity with other TG isozymes was established (Hadjivassiliou et al. 2008). Immunolabelling for TG6 (1 μg/ml) and β-tubulin III (Sigma T3952, 1:50 diluted) was performed as previously described using HRP-conjugated secondary antibodies and AEC (3-amino-9-ethyl carbazole) as a substrate (Aeschlimann et al. 1993). Cerebral cortex of newborn Balb/c mice was dissected on ice in Hanks’ balanced salt solution (HBSS) and digested for 20 min at 37°C in 0.1% trypsin, 0.05% DNAse I (Sigma) in HBSS. The tissue was washed and subsequently triturated in HBSS/DNAse I solution to dissociate cells. Cells were washed and subsequently maintained in DMEM/F12 containing 2% B27 supplement (Invitrogen). Number of vital cells was determined by trypan blue exclusion. For FACS analysis, cells were washed in 0.5% BSA in phosphate-buffered saline, pH 7.4 (PBS), filtered through 40 μm Falcon cell strainers (Becton–Dickinson) to remove remaining aggregates, fixed in 2% paraformaldehyde in PBS for 20 min on ice, permeabilized and stained with antibodies to TG6 (20 μg/ml) and cell lineage markers, glial fibrillary acidic protein (G-A-5, Sigma; 15 μg/ml), β-tubulin III (SDL.3D10, Sigma; 20 μg/ml) and RIP (Chemicon, 1:1,000 diluted). For culture (formation of neurospheres), medium was supplemented with 20 ng/ml FGF2 (R&D Systems), 20 ng/ml EGF (Sigma) and antibiotics and 1 × 106 cells seeded into 35 mm hydrophobic plastic dishes. For immunocytochemistry, cells were seeded at a density of 1 × 105 cells/well in a 12-well plate on laminin-111 coated [purified from EHS tumour (Aeschlimann and Paulsson 1991)] cover slips and grown for 5 days. Cells were fixed in 4% paraformaldehyde, permeabilized and labelled with antibodies to TG6 and cell lineage markers. Protein concentrations were determined using the bicinchoninic acid reagent (Pierce) as described by the supplier with BSA as a standard. For immunoblotting, proteins were separated on 4–20% SDS–PAGE Tris–glycine gels under reducing conditions (1% 2-mercaptoethanol), transferred onto nitrocellulose membranes and stained with antibodies as described (Aeschlimann et al. 1993). We have previously identified a cluster of TG genes in the human and mouse genome that contained a novel gene now termed TGM6 (Grenard et al. 2001). We used RT-PCR to screen different human cell lines for expression of the respective gene product. TG6 (previously called TGY) could not be detected in cells of a wide variety of origins including mesenchymal, epithelial and hematopoietic cells suggesting that it has a restricted expression pattern, but its expression could be verified in a lung small cell carcinoma cell line, H69, both by RT-PCR and Northern blotting (Fig. 1a). A full-length cDNA sequence for TG6 was obtained by PCR using oligo(dT) primed cDNA from H69 cells and a series of sequence specific primers based on the presumed transcribed genomic sequence (Supplemental Fig. 1). 5′-RACE PCR was used to identify the position of exon 1 which contains essentially non-coding sequence and therefore shows no apparent similarity between different TG genes. Primer extension was used to identify the 5′-end of the cDNA and this located the major transcription initiation site 455 nt upstream of the translation start codon (Supplemental Fig. 2). The likely 3′-end of the TG6 transcript may be inferred from an EST sequence in GenBank™ (AA961594). Based on this, a polyadenylation signal (ATAAA) could be located 3,887 nt downstream of the termination codon. This is preceded by a CFIm-binding site (TGTAA) and followed by a GT-rich sequence known to bind CstF and therefore conforms to the tripartite element required for efficient 3′ RNA processing (Venkataraman et al. 2005). The estimated size of the mRNA is therefore 6,480–6,490 nt which is in good agreement with the 6.3 kb transcript detected by Northern blotting (Fig. 1a). A prominent band at ~2.2 kb could indicate that a short transcript may also be abundant but the exact nature of that remains to be investigated. The obtained sequence for full-length human TG6 contained an open reading frame of 2,120 nt. The deduced protein consists of 706 amino acids and has a calculated molecular mass of 79,276 Da. This mass is in good agreement with the size of the single protein band detected by Western blotting of keratinocyte protein extract (natively expressed protein) or when overexpressed in HEK293 cells after transfection with a TG6 expression construct (Fig. 1d). Recombinant enzyme displayed Ca2+-dependent transamidation activity (Fig. 1e). A shorter transcript which apparently resulted from alternative splicing of the sequence encoded by exon 12 was also isolated from H69 cells (Fig. 1b). The absence of exon 12 results in a frame shift and thereby in premature termination within exon 13 (Supplemental Fig. 3). The sequence for the short form of TG6 (TG6-S) encoded a protein consisting of 625 amino acids (M r 70,480, calculated). The TG6-S sequence terminates just after the first C-terminal β-barrel domain and has a unique 14 amino acid C-terminus (Fig. 1c). Overexpression in HEK293 cells gives rise to a stable protein of expected size (Fig. 1d) suggesting that this alternative splicing event may have biological significance. The β-barrel domains have been implicated in the regulation of enzyme-substrate interaction and may also be involved in intracellular signalling as a sequence within the second β-barrel domain of TG2 is required for binding of PLCδ1 (Hwang et al. 1995). The H69 cell line displays neuronal characteristics including expression of neuron-specific enolase, brain isozyme of creatine kinase and l-dopa decarboxylase. We therefore reasoned that TG6 may be expressed in neurons. RT-PCR confirmed TG6 expression in mouse brain (see below). The cDNA sequence for mouse TG6 was isolated from brain, essentially using the same approach as for human (Supplemental Fig. 1). We have not determined the transcription initiation site. However, an EST sequence in GenBank™ (BY357397) derives from the genomic sequence upstream of the sequence we have isolated by RACE PCR indicating that transcription may be initiated at a position 389 nt upstream of the start codon, a position similar to that in the human gene in the aligned sequences. Two consecutive polyadenylation signals are present 1,096 nt downstream of the termination codon (Supplemental Fig. 1). 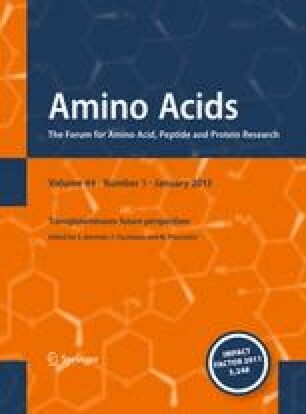 Mouse and human TG6 have an 85% identity on the amino acid level. Cloning identified two splice variants in mouse brain lacking either exon 3 or exon 3 together with exon 4 (Fig. 1c). Alternative splicing of exon 3 has been described by us and others for several TG genes including TG2, TG4, TG5 and band 4.2 protein and results in a TG with an altered N-terminal β-sandwich domain (Cohen et al. 1993; Aeschlimann et al. 1998; Candi et al. 2001; Cho et al. 2010; AK295775 in GenBank™). TG5 lacking exon 3 has no transamidase activity (Candi et al. 2001). Omission of exon 3 and 4 results in a frame shift and premature termination before the sequence encoding the catalytic core domain, giving rise to a hypothetical 66 amino acid polypeptide without TG activity. We could not detect alternative splicing of exon 12 in mouse brain or neuroblastoma cells. An identical sequence to H69 cell TG6-S was recently isolated from another cancer cell suggesting that this splice variant may be associated with oncogenic transformation. Four distinct C-terminally truncated versions of TG2 have been identified. Variants resulting from retention of intron 10 and 6, respectively, have been isolated from human disease states (Fraij et al. 1992; Citron et al. 2002). The former, TG2-S, results in a protein truncated within the sequence encoding β-barrel 1. Another TG2 short form resulting from splicing at an alternative 3′ site within exon 12 and 5′ acceptor site within exon 13 retains β-barrel 1 but has a distinct short C-terminal sequence (Monsonego et al. 1998; Citron et al. 2002). This variant was originally identified in rat astrocytes, but similar variants, TG2-V1 and TG2-V2, resulting from use of two alternative 5′ acceptor sites within exon 13 have subsequently been demonstrated in different human primary cells (Lai et al. 2007). However, in mouse brain no alternatively spliced variants of TG2 could be identified (Citron et al. 2005). Alternative splicing of exon 11 in human TG5 gives rise to a variant truncated within β-barrel 1 analogous to TG2-S (Candi et al. 2001). C-terminal truncation affects allosteric regulation of TG2 by GTP and has profound effects on cell differentiation and survival (Monsonego et al. 1998; Antonyak et al. 2006; Tee et al. 2010). TG6 is a very low abundant transcript as indicated from directly analysing expression in specific cells and tissues as well as from whole genome expression profile studies. For mouse, the GenBank™ database contains a total of 21 independent ESTs. 18 of these are derived from skin and 1 each from retina and brain cortex. EST BB612839 is the splice variant lacking exon 3 and 4. For man, there is only a single EST from a lung small cell carcinoma. As a comparison, for TG2 the UniGene™ EST profile lists over 29,000 ESTs in normal human tissues alone. Alignment of TG sequences selected to represent major branches of animal evolution (Fig. 1f) indicates that the invertebrate and low chordata proteins are most closely related to the vertebrate isoforms TG4 and TG1. The factor XIII a-subunit derives from the same branch as TG1. The band 4.2 proteins show large divergence between species indicating low evolutionary pressure for conservation. In contrast to the mammalian and amphibian sequences, the three reported avian band 4.2 sequences do contain the catalytic triad residues indicating that these proteins may function as active enzyme. Within the vertebrate TGs, the enzymatically inactive band 4.2 protein and TG2 form separate branches. The TG5/TG7 and TG3/TG6 pairs, each encoded by genes located closely together on the same chromosomes, are most closely related. A closer inspection reveals that the frog sequences marked xTG5 and xTG6 in Fig. 1f have ambivalent characteristics, and depending on the settings of alignment parameters could be also regarded as xTG7 and xTG3, respectively. Similarly, two bird sequences are predicted, which share characteristics of the TG5 and TG7 families. These data suggest that TG5/TG7 and TG3/TG6 arose from tandem gene duplication. We have previously proposed that two genome duplications in early vertebrates may have given rise to ancestral TGM1, F13A1, TGMn and TGM4 genes and the ‘TGMn’ branch subsequently further specified through tandem duplication to form the full complement of TG genes in mammals (TG2/3/5-7/EPB42; Grenard et al. 2001). The observation of four principle TG branches for the higher chordata is consistent with the hypothesis of at least one whole genome duplication occurring after the urochordate ascidian Ciona intestinalis, as it has been proposed based on genome comparisons of ancestral vertebrates (Dehal and Boore 2005). More than one TG genes are also present in some protostome genomes. However, these appear to have arisen from gene duplication during prototsome speciation independent from evolution of the TGM genes found in vertebrates. Based on the high sequence similarity between TG6 and TG3 (overall sequence identity: 50 with 59% within the catalytic core domain), we used the high-resolution X-ray derived human TG3 structure (activated form with three bound calcium ions) as a template for generating a model of human TG6-L (Fig. 2a). The flexible solvent exposed loop, which is not resolved in the X-ray structure connects the last α-helical region of the catalytic core to the first β-strand of the β-barrel 1 domain. The active site catalytic triad residues C274, H333 and D356 are at the base of a cavity, which is bound by the catalytic core and β-barrel 1 domains, and buried in a hydrophobic pocket, as in the case of TG3 (Fig. 2b). Consistent with biochemical data and the interpretation of the TG3 structure (Folk and Chung 1973; Ahvazi et al. 2002; Ahvazi and Steinert 2003), it can be assumed that the sulfhydryl group of C274 can form a thiolate-imidazolium ion pair with H333. The second nitrogen atom of the H333 ring is in hydrogen-bonding distance to the side chain oxygen atom of D356. The indole rings of the two tryptophan residues W238 and W330 are buried near the surface as in TG3 (W236, W327). It has been proposed that as a suitable glutamyl substrate approaches, an oxyanion intermediate forms with the former tryptophan, which results in break-down of the substrate to release NH3 and forms a thiol-acyl intermediate with the enzyme. This intermediate is attacked by the ε-amine of a lysyl substrate to form another tetrahedral oxyanion intermediate with the latter tryptophan resulting in a cross-linked product (Pedersen et al. 1994). As in the TG3 structure, the corresponding hydroxyl oxygen of Y538 from the β-barrel 1 domain is within hydrogen-bonding distance of C274 and W238 and is located in the loop of the sequence motif I536–T539 that obstructs the entrance to the active site. The pair of serine residue S469↓S470 in TG3, which serve as cleavage site for proteolytic activation by cathepsin L (Cheng et al. 2006), is not found in TG6 though cleavage by another enzyme cannot be ruled out. However, TG6 has a high specific activity in the absence of proteolytic processing (Fig. 1d). A redox-sensitive Cys switch that is involved in oxidative inactivation of TG2 through formation of a vicinal disulfide bond (Cys370–Cys371) (Stamnaes et al. 2010a) is not replicated in TG6 in the same form as Cys230 is replaced by a serine residue. Nevertheless, TG6 is profoundly sensitive to oxidative inactivation. It is well established that transamidation activity of TGs requires binding of calcium ions (Folk and Chung 1973). As expected, activation of TG6 requires Ca2+-binding and TG6 was found to display a similar concentration-dependence for activation as TG2 (Fig. 1e). In the case of factor XIII a, the activated enzyme contains a single calcium ion in a position near to the catalytic site (Fox et al. 1999) though its binding does not markedly alter the structure. For the zymogen form of TG3, a single tightly bound calcium ion has been found, but two further ions are bound upon proteolytic activation (Ahvazi et al. 2002). In our model of TG6, the highest affinity binding site 1 observed for TG3 is well conserved bringing the main chain carbonyl oxygen atoms of A223, N226, N228 and the side chain oxygens of N226, and D230 into coordinating distance of the TG3 inferred calcium ion position (Fig. 2c). A second calcium-binding site can be inferred to be formed by residues close to the C-terminal end of the catalytic core domain adjacent to the loop which joins the β-barrel 1 domain. The main chain oxygen atom of T417, and side-chain oxygens of N396, E445 and E450 are in a position to coordinate a calcium ion. In the case of TG3, calcium access to the related site in the zymogen form is hampered by the flexible loop (residues 462–471), which must be cleaved to allow entry. We do not yet know whether such a cleavage occurs in the case of TG6, though it could be speculated that the 11 residues longer loop might be more flexible to allow entry to this site, and this is supported by the high specific activity of the intact TG6 (Fig. 1e). A third calcium-binding site reported for activated TG3 is found adjacent to the catalytic triad histidine residue within a loop the position of which is shifted upon activation. The residues involved in calcium coordination are all conserved within the TG6 sequence and structural modelling suggests a corresponding orientation with the main chain carbonyl of S309 and side chain oxygen atoms of D303, D305, D327 and N307 as putative calcium acceptor sites. It has been shown for TG2 (Achyuthan and Greenberg 1987; Im et al. 1990), TG3 (Boeshans et al. 2007) and TG5 (Candi et al. 2004) that enzymatic activity is inhibited by purine nucleotides. Ca2+-binding and nucleotide binding occur at different sites and stabilize distinct conformations of TGs. The affinity of GTP is substantially reduced in the presence of extracellular Ca2+ concentrations allowing enzyme activation. In contrast to ATP, the affinity for GTP and Mg-GTP is high and therefore of biological significance. Besides inhibiting transamidation activity intracellularly, independent functions of GTP binding and hydrolysis in intracellular signalling have been proposed for TG2 (Im et al. 1990; Stephens et al. 2004; Iismaa et al. 2009). We therefore determined the transamidation activity of TG6 in the presence of various nucleotides (Fig. 2d) using a quenched fluorescent substrate, Abz-APE(γ-cad-Dnp)QEA, for real-time monitoring as suggested by Lorand and co-workers (Parameswaran et al. 1997). Folk’s work has shown that the reaction occurs in a two-step mechanism whereby the active site thiol is transiently acylated by the γ-carboxamide group of the peptide-bound glutamine to form a stable acyl-enzyme intermediate. The second step involves either hydrolysis to convert Q to E or aminolysis by reaction with a primary amine to form the isopeptide bond and this is rate-limiting (Folk and Chung 1973). This reaction is reversible and steady-state kinetics can be performed by coupling isopeptide hydrolysis to a second reaction driven by an excess amine donor substrate. Given that the reactive nucleophilic form of the substrate is the neutral amine, maximum substrate conversion is achieved with amines deprotonated at physiological pH such as glycinemethylester or ethylene diamine (pKa < 7) (Leblanc et al. 2001). The sequence of the fluorescent substrate is based on the amine acceptor site of osteonectin/BM-40/SPARC for TG2 (Hohenadl et al. 1995). Nevertheless, the kinetic parameters given in Table 1 show that this peptide is a better substrate for TG6 than for TG2. When compared with TG2, a ~50-fold higher concentration of GTP (200 μM) is required for half-maximal inhibition of TG6, whereas for ATP (~1 mM) similarly high concentrations are needed. The non-hydrolyzable GTP analogue GTPγS is a more effective inhibitor than GTP as has been reported for TG2 (Achyuthan and Greenberg 1987). Activity of TG6 is inhibited to a similar degree by GTP and GDP both in the absence and presence of 1 mM Mg2+, but the affinity for GMP is low. Taken together, these data suggest that TG6 has the potential to function as a guanine nucleotide exchange factor in receptor signalling similar to TG2. Based on the GDP-bound form of human TG2 (PDB code 1KV3, chain C, Liu et al. 2002), we modelled a putative corresponding nucleotide-binding pocket between the catalytic and β-barrel 1 domains (Fig. 2e). Such a TG6 GDP-binding site would be delineated by residues K170 and H171 from the catalytic domain, and K498 to P505 as well as K600 to E605 from the β-barrel 1 domain. The ε-amino groups of lysine residues 170, 498, 500 and 600 envelop the phosphate groups of GDP, whereas V501–P505 and L604 surround the guanine group which is stacked by the imidazole ring of H171. In TG2, R478 and R580 form two ion pairs with the GDP α- and β-phosphates. These residues are replaced by K500 and K600 in TG6. S482 and Y583 of TG2, which form hydrogen bonds with the N1 and N2 atoms of the guanine base are replaced by P505 and T603, respectively, in TG6 of which the main chain oxygen of T603 hydrogen bonds to N1 and N2, and its oxygen to O6. Although the fold around a putative GDP molecule can be well adopted by TG6, the reduced number of interactions could be the cause for the observed decrease in nucleotide affinity (Fig. 2d). There is a large degree of overlap in glutamine donor substrates of TG6, TG3, and TG2. On the level of fine specificity, however, clear differences exist. In peptides, TG2 has a highly sequence-dependent targeting (Gorman and Folk 1984; Vader et al. 2002; Hitomi et al. 2009), whereas TG6 shows tolerance to a broader spectrum of sequence changes in the neighbouring amino acids (Stamnaes et al. 2010b). The most significant influence on substrate properties is exerted by proline residues. None of the enzymes can modify glutamine residues directly followed by proline (-QP-), whereas proline at position +2 (-QXP-) exerts a positive influence. Furthermore, while all three enzymes readily target -PQ- sequences, proline in position −2 (-PPQ-) has a detrimental effect on recognition by TG2, but not TG6 or TG3. An indication that different positions may have a greater impact on substrate recognition by the different enzymes comes from the observed differences in relation to altered peptide length N- or C-terminal to the reactive glutamine residue. TG6 and TG2 are profoundly sensitive to the C-terminal sequence, whereas reactivity of TG3 with peptide substrates is primarily influenced by the sequence N-terminal to the glutamine residue (Stamnaes et al. 2010b). TG6 can both deamidate (Stamnaes et al. 2010b) and transamidate (Fig. 1d) glutamine residues, but it has not been determined yet for TG6 whether the type of modification that occurs preferentially is influenced by the sequence context as has been demonstrated for TG2 (Boros et al. 2006). RT-PCR from mouse brain cDNA using specific primers for TG6 and also the other members of the TG family revealed expression of TG1, TG2, TG3, TG5, TG6 and TG7 (Fig. 3a). These results are consistent with demonstration of expression of TG1, TG2, TG3, and TG5 in the brain (Kim et al. 1999; Bailey and Johnson 2004; Bailey et al. 2004) and together with cell biological studies points to a highly complex regulation of TG genes in the CNS. To obtain a clearer understanding of TG6 expression on the cellular level, in situ hybridisation was performed on sagittal newborn mouse sections. An antisense RNA fragment corresponding to the C-terminal end of TG6 was used as a probe as this area has the least similarity between the different TGs and a similar human probe gave no cross-hybridisation with other TG gene products in Northern blotting. In situ hybridisation revealed that TG6 expression is widespread in the brain (Fig. 3b), most prominently within the cell layers containing the neuronal cell bodies of the cerebral cortex (particularly layers II–IV containing granular neurons and pyramidal cells) (image d), olfactory lobe (data not shown; see Fig. 3c, image c) and the cerebellum (Purkinje cells) (image g). TG6 expression was detected in the spinal cord (image i) and in the retinal cells of the eye (data not shown). TG6 was expressed in tissues other than the CNS, most prominently in the skin (image h) and other stratified squamous epithelia. Interestingly, these cells derive embryologically from a common ectodermal progenitor. Immunolabelling with antibodies confirmed TG6 protein expression (image f). Given the prominent expression of TG6 in the CNS in the developed organism, we were interested to identify whether the induction of TG6 expression correlated with any specific events in development. While the CNS is the first organ system to develop and to differentiate, it is also one of the last to be completed. The primary parts of the mouse brain can be identified soon after the neural groove, neural plate and head process stage at E7.5, and by day E14 has the typical anatomical layout of a mammalian brain. The neocortex is a highly organized six-layered structure that contains hundreds of different neuronal cell types and various subsets of glia. Progenitors residing in the ventricular zone produce the neurons of the different neocortical layers in a tightly controlled temporal order between about days E11 and E17.5 (Molyneaux et al. 2007). In situ hybridisation was therefore carried out on stage E11, E13 and E16 embryos (Fig. 3c). The walls of the primitive brain divide into an inner ependymal, an intermediate mantel, and outer marginal layer by E10, whereby the ependymal layer that ultimately forms the lining of the ventricles of the brain is the thickest layer. At E11, active proliferation of neuroblastic cells occurs in the walls of the entire CNS and these begin to occlude some of the neural cavities. Up to E11, the major neuroblastic activity is occurring behind the hindbrain where cranial ganglia V to IX develop. Little TG6 expression can be detected in the brain at E11 while labelling can be seen in the developing spinal cord (Fig. 3c, image a, arrow). By E13, TG6 expression is apparent in several parts of the brain and strong expression can now be detected in regions undergoing neuronal differentiation such as the mesencephalon (image b, arrow). From E13 to 16, the major neuroblastic activity occurs in the telencephalon where cells from the mantle layer migrate into the overlying marginal zone to form the neocortex which will become the outer grey matter of the cerebral hemispheres. At E13, TG6 expression is detected in a thin layer of the neocortex, presumably progenitor cells constituting the preplate (image e). By E16, TG6 is highly expressed in the outer layers of the neocortex (image f). TG6 mRNA expression is most prominent within the area of the cortical plate where neuronal differentiation occurs to form layers II–IV (image f). TG6 protein is most prominent within layers V/VI where postmitotic neurons can be labelled for β-tubulin III at this stage (image g). Induction of TG6 expression appears to correlate both spatially and temporally with neurogenesis. In contrast, in situ hybridisation with a TG5 antisense RNA probe showed widespread expression throughout the CNS by E11 (data not shown). Towards the latter stages of corticogenesis, astrocytes differentiate from radial glia. To clarify whether TG6 expression was associated with neurogenesis or astrocyte differentiation, progenitors were isolated from P0 stage mouse cortex and expanded in suspension culture as neurospheres (Murayama et al. 2002). To induce neuronal differentiation, progenitors were seeded on a laminin-111 substrate in the absence of mitogen for 5 days and subsequently labelled for TG6 and cell lineage markers. Cells of the neuronal lineage were identified using antibodies against β-tubulin III (Tuj-1), astrocytes with antibodies to glial fibrillary acidic protein (GFAP) and oligodendrocytes with RIP-antibodies (Sergent-Tanguy et al. 2003). Immunocytochemistry confirmed expression of TG6 in neuronal cells and its absence from the astroglial and oligodendroglial lineage (Fig. 4a). To exclude de novo expression of TG6 in neurons as a consequence of culture conditions, freshly isolated cells from the cerebral cortex of newborn mice were double-labelled with antibodies to TG6 and to the above cell lineage markers and analysed by FACS. 81% of cells were positive for TG6 and 58% for β-tubulin III, with 99% of β-tubulin III positive cells also positive for TG6. Physical parameters can be used to distinguish neurons, astrocytes and microglial cells as they differ in size and morphology (Sergent-Tanguy et al. 2003). Therefore, we plotted forward scatter (FSC), representing cell size, as a function of fluorescence intensity for TG6 labelling. Within the broad distribution of cells expressing TG6, two clusters of cells of different size were apparent and were gated (Supplemental Fig. 4, R1 and R2). Further analysis of gated cells for expression of cell lineage markers showed that both clusters were exclusively positive for β-tubulin III indicating that they are derived from the neuronal lineage and represent different neuronal populations (Supplemental Fig. 4). Neuro2A is a mouse neural crest-derived cell line that has been extensively used to study neuronal differentiation, and specification into different neuronal lineages is possible (Tremblay et al. 2010). We initially confirmed that non-lineage-specific differentiation in low serum induced TG6 expression and subsequently used a number of differentiation factors to induce lineage-specific differentiation (Fig. 4b). Non-cholinergic differentiation with neurotrophin NGF was associated with strong upregulation of TG6. TG6 expression was also induced upon dopaminergic differentiation using dibutyryl cAMP, whereas TG6 was not upregulated in cells treated with retinoic acid, a known inhibitor of dopaminergic differentiation. Quantitative PCR indicated that TG6 expression was upregulated twofold upon serum starvation and fourfold by dibutyryl cAMP. Dopamine neurons are formed in the olfactory lobe and retina during embryonic development, two areas where strong TG6 expression was seen in in situ hybridization (Fig. 3). However, the highest level of TG6 expression in Neuro 2a cells was observed upon induction of cell death by metal ion chelation suggesting that the strong TG6 expression observed during cerebral cortex development may relate in parts to association with programmed cell death rather than neuronal differentiation. Celiac disease (CD) is a common T cell-mediated autoimmune disorder characterized by its linkage to specific human lymphocyte antigen alleles, HLA-DQ2 and -DQ8 (Jabri and Sollid 2009). In susceptible individuals, consumption of gluten triggers a CD4+ T-cell response to gliadin as well as a B cell response to gliadin and self antigens. TG2 contributes to disease development in at least two ways: first, by deamidating gluten peptides, thereby increasing their reactivity with HLA-DQ2/DQ8, which potentiates the T-cell response (Molberg et al. 1998; Van de Wal et al. 1998). Second, TG2 is the major autoantigen targeted by the B cell response (Dietrich et al. 1997). Although the T-cell response in the mucosa of the small intestine is the key player in disease development, gluten sensitivity is a systemic disease and autoantibodies may play a role in extraintestinal pathogenesis (Caja et al. 2011). This is supported by the recent demonstration of circulation derived anti-TG3 autoantibodies inducing a dermatitis herpetiformis-like pathology in human skin-grafted SCID mice (Zone et al. 2011). Neurological disorders have also been recognised as a form of extraintestinal manifestation of gluten sensitivity, with cerebellar involvement (gluten ataxia) and peripheral nerve involvement (gluten neuropathy) being the most common presentations (Hadjivassiliou et al. 2010). We have shown that gluten ataxia patients develop autoantibodies that are specific to TG6 (Hadjivassiliou et al. 2008). Furthermore, antibodies isolated from celiac disease patients are frequently reactive with human and mouse neurons. However, this neuronal reactivity is specific for antibodies that are crossreactive between the closely related TG2, TG3 and TG6 enzymes and is not mediated by TG2 as it is preserved in a TG2−/− background (Boscolo et al. 2010). This is consistent with TG2 being primarily associated with the vasculature in non-disease brain (Aeschlimann and Paulsson 1991; Hadjivassiliou et al. 2008; Boscolo et al. 2010) and suggests that TG6 may be the neuronal autoantigen recognised in these patients. To test whether patient-derived autoantibodies directly contribute to pathology we attempted passive disease transfer. Serum immunoglobulin from gluten ataxia patients, as well as clonal anti-TG immunoglobulins derived using phage display, caused deficits in motor coordination but not anxiety when injected intraventricularly in mice (Boscolo et al. 2010). The fact that isolated anti-TG immunoglobulins induce dramatic ataxia-like deficits in mice indicates selective neurotoxicity of anti-TG antibodies once exposed to the CNS and suggests that antibodies may play a role in disease transfer to the CNS. However, both scFv crossreactive between different TGs and TG2-specific scFv compromised motor coordination in mice. Cerebellar ataxias are a complex and heterogeneous group of neurodegenerative diseases characterized by progressive imbalance and limb movement deficits. About 20% of cerebellar ataxias display a familial inheritance pattern. So far, 30 different genetic loci have been linked to different SCA subtypes and 19 causative genes identified. Among those are CAG repeat expansion diseases including SCA1–3, 6–8, 12, 17, 31 and DRPLA and non-repeat mutations such as SCA 5, 11, 13–16, 27 and 28. A recent paper identified mutations in TGM6 in two Chinese families with autosomal dominant ataxia using linkage analysis and exome sequencing (Wang et al. 2010). Taken together with our demonstration of neuronal expression of TG6 and the presence of autoantibodies to TG6 in immune-mediated ataxia, this suggests that TG6 may play an important role in neurons involved in motor control. The mutations identified in TGM6 are single nucleotide exchanges leading to alteration of amino acid residues that are strictly conserved in TG6 among different species (D327G, L517W). Structural modelling suggests that the former substitution could interfere with Ca2+ binding at site 3 (Fig. 2c) and may therefore compromise enzyme activation, whereas the deleterious effect of the latter substitution remains obscure. It is also not clear why mutation of a single allele should produce a dominant ataxia phenotype. Haploinsufficiency is possible but one might also speculate that the problem is unrelated to the catalytic function and could be caused by difficulties in folding of mutant proteins and this may ultimately be neurotoxic. It is also interesting to note that alternative splicing or mutations in TG2 that affect its regulation by GTP have been shown to have dramatic effects on neuronal differentiation and to be pro-apoptotic in different cell types (Antonyak et al. 2006; Tee et al. 2010). In order to gain a better understanding of the TG6-related pathology further work needs to address the physiological function of TG6 in the CNS. Given that TG6 similar to TG2 is a protein that can be detected in the cell cytosol as well as at the cell surface it may have independent intra- and extracellular functions that may employ the enzyme’s ability to bind GTP or act as a Ca2+-dependent crosslinking enzyme, respectively. Recent progress in the development of more isozyme-specific inhibitors may facilitate the elucidation of the context within which TG6 is activated and plays a critical role. We are grateful to Dr V. Pekarik for advice regarding the culture of primary neuronal progenitor cells. This study was supported by a grant from Coeliac UK and Arthritis Research UK (18461) and PhD studentships from Cardiff University to HT and MA. The nucleotide sequences reported in this paper have been deposited in the GenBank™/EBI Data Bank with the accession numbers AF540969 (full length) and AF540970 (exon 12 splice variant) for human TG6 and AY159126 (full length), AY177606 (exon 3/4 splice variant) and AY177607 (alternative exon 1) for mouse TG6.